Snow isn’t something we see very often. I’ve lived in the San Francisco Bay Area for more than half my life and my kids have never lived anywhere besides California, so snow — and all the fun things that go along with it — is a very rare treat. We’re visiting my parents in Iowa for Christmas right now and earlier this week we were treated to a perfect snow storm. Not too little, not too much, not too icy — just right. This is Augie’s first real snow experience and Wyatt’s first snow in several years and it’s been pretty dang awesome. 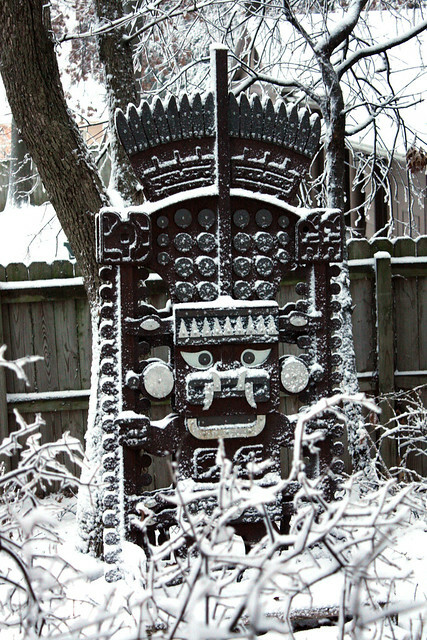 When the snow started, Augie could barely contain himself. 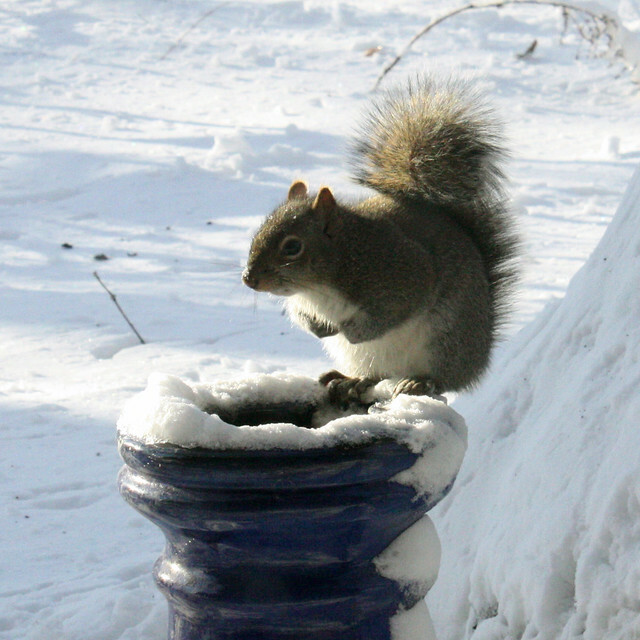 He stood at the window watching it come down and once it started sticking, he had to go out and get his hands on some. We slipped on some shoes and stepped out onto my parents’ deck where he looked up into the sky and tried to catch snowflakes on his tongue. He really, really wanted to make a snowball so I scooped up half the snow on the deck, then helped him pack it together into a teeny little snowball. We were cold and he was excited to show it to his brother, so we ran back inside to warm up. 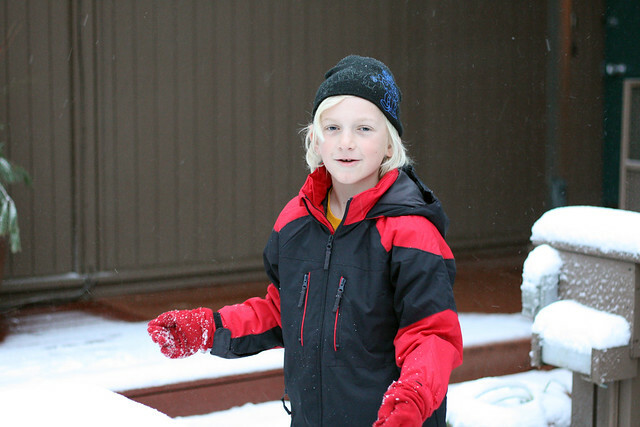 Once Wyatt saw the snowball he wanted to play in the snow too. I insisted on boots, mittens, and hats for this trip outside and by the time we wrestled everyone into their warm clothes the snow was a bit more impressive. We went out under the streetlight so we’d have a little light to see by and the boys ran and whooped and reveled in the snow falling from the sky. 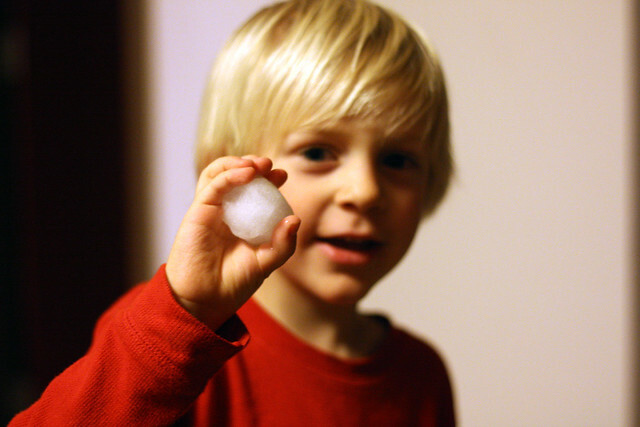 Wyatt packed his first snowball together and chucked it at his little brother (of course). 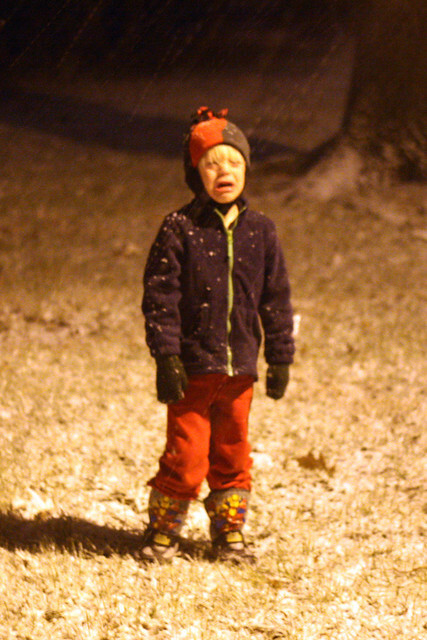 Augie was less enchanted with snowballs after being on the receiving end of one. The next morning, Wyatt woke me up at first light to show me “the fairy land outside”. 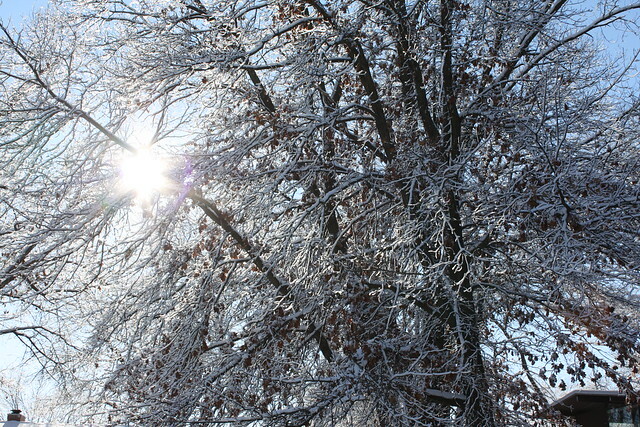 Every branch was covered with snow and ice and my darling boy was entranced by the sun shining through the trees. You know the world is particularly beautiful when an eight year boy repeatedly tells you so. And the tall trees in the yard were gorgeous against the blue sky. My parents have bird feeders everywhere so there were birds all around us picking up a little breakfast — dozens and dozens of birds! 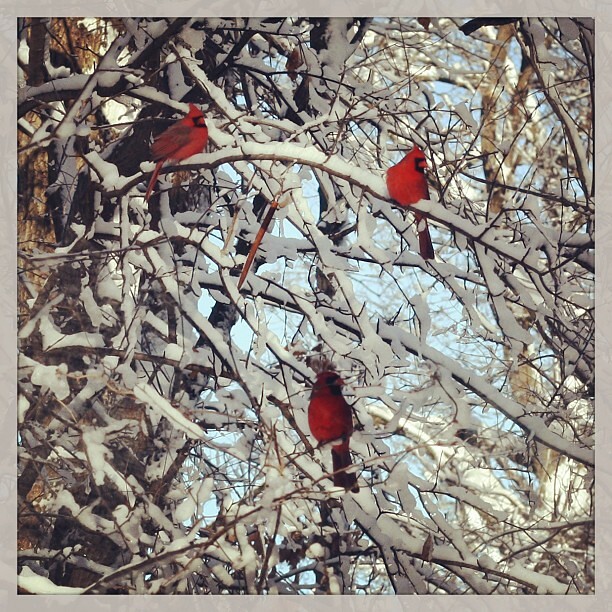 After we went back inside to make breakfast, I spotted these these cardinals sitting on a tree just outside the kitchen window. They were breath-taking! 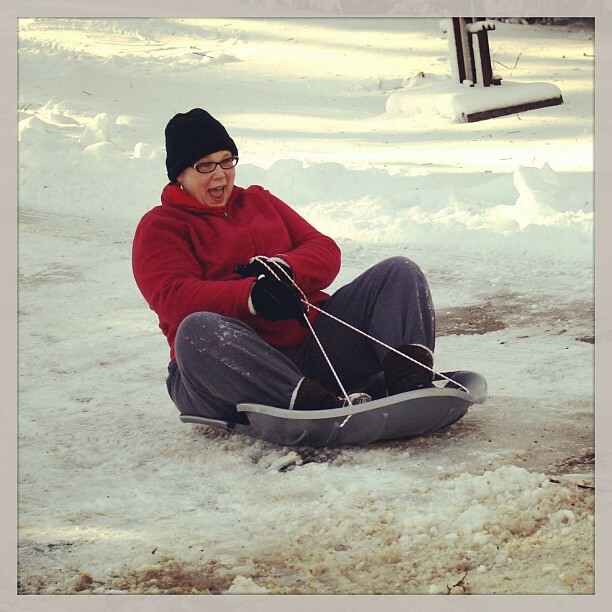 Yesterday the snow had stopped completely so we got really bundled up and headed out to sled down the driveway. 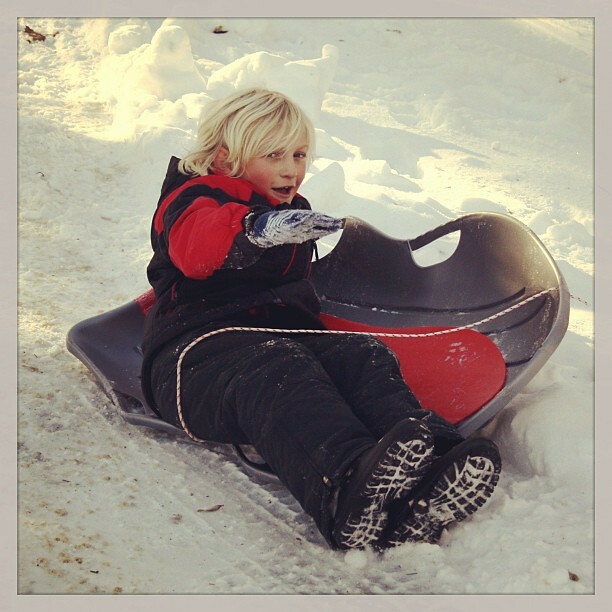 After a quick lesson, Wyatt got the hang of sledding pretty quickly. He was even fairly cheerful about his first wipe-out. Grandma joined in on the fun too! 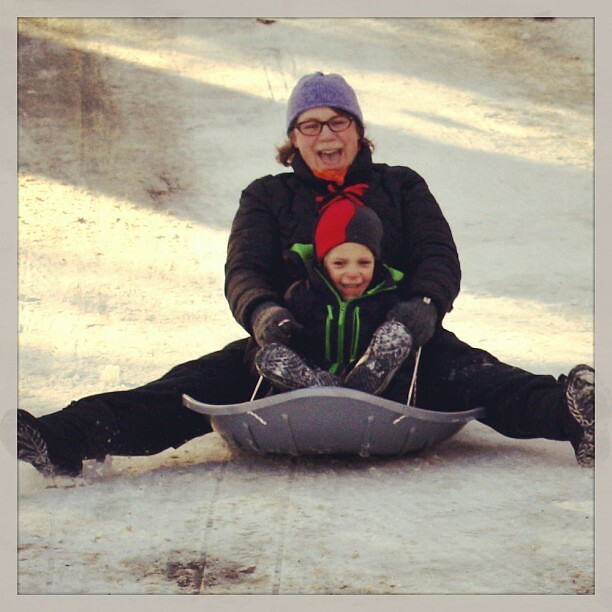 And Augie and I shared a sled. He adored it until he slipped and fell on the ice and then he was totally done with it. 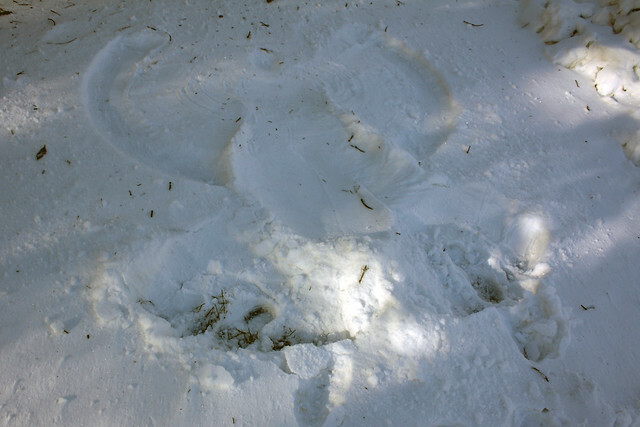 I decided that I needed to make a quick snow angle before we headed back into the house, so I plopped down in the yard and swished my arms back and forth. As I looked up into the brilliant blue sky, I noticed a bald eagle circling above me. I kid you not — there was a majestic, gorgeous, huge eagle right above my head! And then this sweet little squirrel started braiding my hair! And I noticed a unicorn prancing and tossing her rainbow mane in the trees off to the left of where I stood! 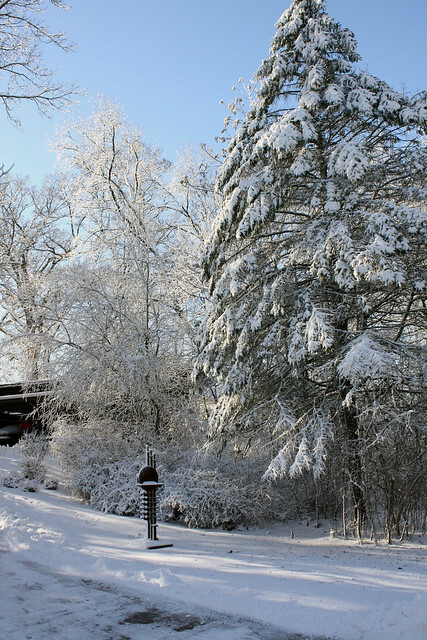 I know that if we lived here and we had to go to work, school or the grocery store to buy milk and Pull-ups the snow would not be quite so enchanting. But when we are spending time with people we love and we have nothing to do but enjoy ourselves, it’s pretty magical. What’s amazed you this week?